So I've given fmq a try and I can't seem to get it right at all. I even tried using a stencil and following the lines with my fmq foot and it went horribly. Just can't seem to get the hang of it. Only tried it for a short time , but I think I may stick to straight line quilting. Is it something that gets easier? Or is it one of those skills that you either have it or you don't? 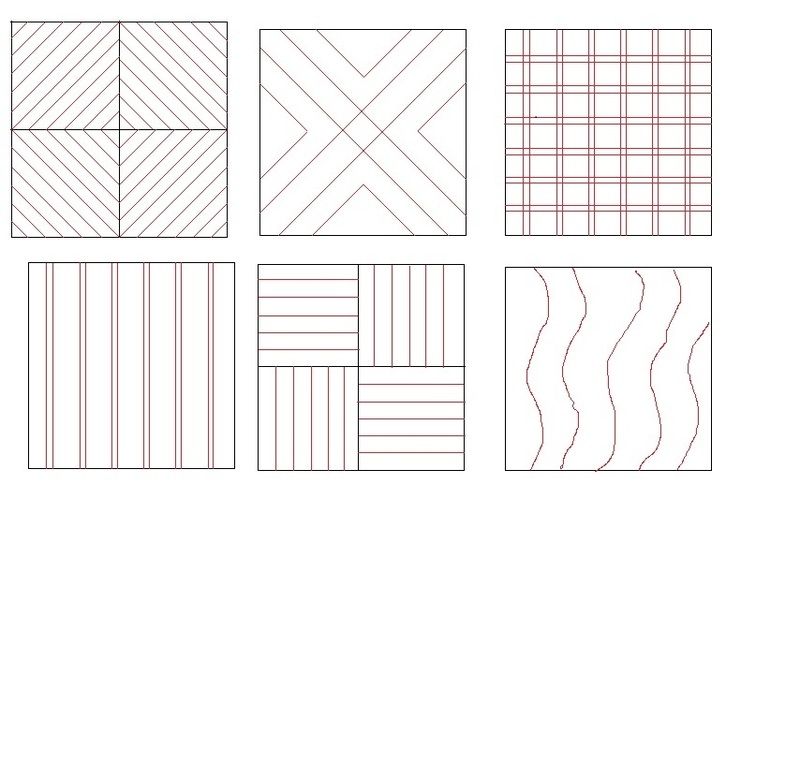 Perhaps if you start by looking at straight line quilting with a different eye it will help. There is much more than just stitch in the ditch. I posted this graphic just recently, but I suppose it's worth doing so again. From what I have read, fmq takes lots and lots of practice. I haven't mastered it yet. Of course I haven't spent much time on it either. Every time I try, it gets worse so I have stuck with straight line quilting for the time being. Good luck to you. It is also the speed of the machine and the speed of your hands linking together. Remember learning to drive 3 pedals steering wheel and a gear stick and brake . And only 2 hands and 2 feet. It's the sae problem. Keep trying. Personally I like the speed of the machine to be not on full but 1/4 down. I can then manage my hands better. Thanks Jan. I missed that the first time around. there is a learning curve---and it takes a lot of practice/patience. can you sit down at a piano and after a 'little while' play a concerto? probably not- it takes practice put together practice sandwiches (pot holders/placemats work well) and practice. if you have a stack of practice pieces made up & sitting there- each time you are going to sew either start with a little practice- or end with one---before you know it you will be showing improvement- ready to start on something a little bigger (table runner, baby quilt) a few months down the road you will look at those first pieces and be able to see how far you have come. There are a lot of youtube videos on quilting you could watch and also check out Patsy Thompson's website she has instructional videos and she does all her quilting on a home sewing machine. She has lots of tips but the best advice I can give you is don't beat yourself up about FMQing it takes time and patience and lots of practice. Start by doodling on sketch paper and remember have fun with it. Leah day explains how to modify your foot to make it easier. I drop the feed dogs. It is easier to do with a smaller quilt. I would start practice with a doll quilt or mini. The gloves help a lot and there are other devices that can. Help too. It takes several hours of practice before you start to get a rhythm. Look at the complexity of your stencils or markings too. Try to use a very forgiving pattern or stencil. It is easier for me to FMQ without trying to follow lines exactly. I use the golden threads or tissue paper if I want a certain design placed just so. It allows you to kind of follow the pattern but you don't have to be too careful because you are going to tear off the paper. If doing feathers I mark the spine and do the rest freehand. It also helps if you can do a certain design following the seams as a guide like orange peel pattern. Are you practicing on an actual quilt or sample sandwiches? Small samples about 15 to 18" square are great to start with. Start on paper and just repeat drawing circles and curves. It is a hand - memory skill which takes practice. No one is born with this skill. It is learned. Draw lines right on the fabric and work to stay inside the lines just like learning to write when we were kids. Once you feel okay with how your curves look on paper go to the machine and practice there. SLOW YOUR SPEED DOWN. No need for a heavy foot. As you get comfortable just moving the fabric around start doing loops and smaller curves, waves, figure eights are great for practicing. There are many places to get ideas for quilting patterns to practice on. do a search. Slow, relax, breath, shoulders down. Take a few slow small stitches as you start and stop. Just like driving, you don't start out at 60 mph. Practice doing a straight line and then put a loop it one direction then the opposite. The one thing I learned is to have paper to practice any design on before going to the machine. Any paper will do even old news paper. It is all to get the hand memory going. Hope some of this stuff helps you to keep going. I've been there so I understand. It can be discouraging but don't give up. You are all great, i think i need gloves as i found moving the fabric around was an issue. Also, when trying to turn it seemed like the needle would jump to a different spot. also just using some ugly fabric sandwiched into a placemat size to practice on. I would never even think of practicing on actual quilt. Yes, it takes lots and lots of practice. And even more practice, but all the practice isn't wasted, because you keep getting better. And more comfortable with it, and learning what techniques work for you. Don't give up!! My first effort was just loop-de-loops and then I went to a simple jig-saw meander. After my fourth effort my meanders are starting to look pretty darn good. If you're trying to do feathers then you're way beyond me and should congratulate yourself on having the courage to leap in and try. As every poster before me has said, it just takes practice and pretty soon you'll do great. You have to practice,practice,practice. Think how long it took you to learn to read, ride a bike,drive a car. Everything new requires practice. You should have seen me the first time I learned to drive a manual transmission. Ouch! There were some grinding of gears, let me tell you. But, you should see me now,it has become second nature to me.I don't have to watch the tach to when to shift, I am listening for the change in engine,even while I am driving and talking to someone else. The point is, if you try anything for a short time and quit,how will you ever know if you can do it or not.I guess I am just to stubborn to quit until I have mastered whatever task that is before me. Keep trying! Don't give up......I started two years ago and started with Quilting Made Easy stippling patterns. Once I got that figured out I moved on to circles. Meandering came next. Now I combine the three and will practice something new next. It really does take a lot of practice but don't start out with something difficult or you will get frustrated. The book explains how to use the walking foot to make designs including circles and curves. There is a lot of variation from SID. You can also do echo. I am in the same boat meldmac, I find FMQ soooo hard to do, but like a lot are saying practise makes perfect, grrrrr! Thank you, Jan, this is helpful. I'm working on both fmq and straight lines all the time. I bought the Line Tamer ruler at Four Paws Quilting to use with the Sweet Sixteen and it's really helpful. My needle used to "jump" also. Then I started looking at the fabric under the needle after I had been working to straighten out the next line to sew. It is usually kind of bunched up. Even if I'm just making a straight seam in my piecing it does that. Of course the needle is down, so now I leave the needle down and lift the presser foot. It's amazing how much the fabric moves. After the fabric is lying smooth and relaxed, I can start sewing again. No more jumping. Just takes a split second to lift the presser foot and look at the fabric around the needle. Sometimes it just pops back into place. I couldn't FMQ without gloves. Even the cheapy vinyl gloves work. I have only FMQ four quilts on my DHM. I was very happy with the first one (after some practicing on sandwiches). The second one - not so hot. I seemed to have gotten worse. But I persisted and on the third one it was much better. I'm very pleased with the fourth quilt. I haven't used gloves yet because I had some of the rubber finger tips already and I put them on my middle fingers and thumbs. I have much better control then. I may get the gloves and try that as my fingers do sweat with the rubber tips - but that also gives me a short break when I'm FMQ to stop and take them off for just a bit. Helps me to relax too. Have fun above all else. This is so true. I couldn't do FMQ at all for the longest time. It just looked BAD, the thread broke, there were knots, etc. Then one day without feeling like I changed anything, I looked OK. I figure if I keep plugging away at OK, it will magically look good one day. On the other hand, there is no law that quilters must ever use FMQ. Many beautiful quilts are done with designs that can be done with a walking foot. Thanks Jan, I too missed this chart the first time around. Glad you posted again.